A perfect storm of fire and ice may have led to snowball Earth | Watts Up With That? About 700 million years ago, runaway glaciers covered the entire planet in ice. Harvard researchers modeled the conditions that may have led to this so-called ‘snowball Earth’. March 13, 2017 in Paleoclimatology. A bit OT but…concerning the faint young sun paradox, well I have read that the moon used to be closer to the earth but is now farther away due to tidal drag, okay I wonder if the earth used to be closer to the sun in a like manner, and so if the sun was fainter way back then that is okay because the earth was closer? Almost certainly not. The Moon/Earth tidal and tidal locking orbital interactions are because they are so close. Mercury is not tidally locked to the Sun. Double ditto Earth/Sun. So the slow orbital alterations you posit cannot physically take place. Newton rules. Is also why all true planets are in a roughly planar orbit around Sun. (And another reason why Pluto, which isn’t, isn’t a planet. It is an eccentric planetoid, albeit a very large one, from the Oort cloud of planitsimals. True Planets formed from the Suns roughly planar accretion disk. Accretion discs are simply explained by the basic physics of gravitationally infalling mass toward the Sun having to conserve any residual angular momentum. Sun spins. All infalling matter therefore must also spin (other wise Sun would not spin) and accretion discs automatically form from that fact. Don’t post stuff that shows your ignorance. the devil is always in the details of how these rules are applied. the planetary orbits are much more complicated, as demonstrated by the rotation of Venus, which always presents the same face to earth at closest approach. at first glance, the tidal forces between earth and venus are two small to achieve this. However, like a child on a swing, a small force repeated in phase results in a large motion over time, regardless of the size of the forces, especially when the environment effectively has no friction. Look at the orbits of the planets. They are not simply stable with respect to the sun, they must be stable with respect to each other. At closest approach the planets tug on each other. This affect is asymmetric because the orbits are not circular with respect to each other. Like a spacecraft in orbital boost around a planet or sun, the planets speed up as they approach each other, and slow down as they pass by each other. Over time this pulls the orbits into a plane, as the system as a whole always seeks to minimize its total energy level. That is why boats without power automatically turn broadside to the wind, because it takes less energy to roll than to pitch. Orbits in a plane are obeying a similar mechanism. Which is one of the great mysteries of science, how natural objects know what path to take to minimize the energy of the system. And similarly, over time, as each planets speeds up and slows down in response to its neighbors, its orbit increases or decreases in distance with respect to the sun, until the planets are in phase with respect to each other, again to minimize the energy level of the system, which is why we see near integer resonance. This mechanism serves to somewhat lock the planets in their orbits, similar to the effects of the shepherding moons on Saturn’s rings, but it also has consequences. Because on occasion planets can be ejected from their orbits by this mechanism; in which case all the other planets over time will adjust their orbits to minimize the overall energy level of the system. So the question is this, has the earth’s orbit always been 93 million miles from the sun? That would depend. Have the other planets always been in the same orbits they are today? I expect that none of us can answer that questions. I vote for promoting Pluto to full planet status. As far as I’m concerned, if it’s round, has layers, and doesn’t circle a larger body, it’s a planet. I agree. I believe there is a movement among some astronomers to promote Pluto back to being a planet, along with similar solar system bodies. Defining Pluto as a planet would also require that Ceres the asteroid be defined as a planet, and dwarf planets in the Oort cloud would also have to be defined as planets. There are several, about as large as Pluto, or even larger. Also why limit planets to not orbit larger planets? Several of Jupiter’s and Saturn’s moons are larger than Mercury. Why not our moon? My point is that you have to make a choice and then not make an issue of it. I think Pluto not being defined as a planet is a reasonable choice, and the others I mentioned also being not defined as a planet. Defining things does not change what they are, it only changes the book-keeping. John Bell is not talking about tidal locking, rather about tidal forces on the earth which are currently causing the mood to move further from the earth. I suspect that the forces John asks about exist, but are so much weaker that even over 4 billion years they wouldn’t cause the earth’s orbit to change by more than a few thousand miles. How do we know that Pluto has layers? I recall reading many years ago that some considered our Earth- Moon system to be more correctly considered a double planet system. Our Earth and Moon rotate around a common barycenter which happens to be below the surface of the earth. However, the argument was that overall with respect to the Sun, both our Earth and Moon have a concave orbits with respect to the Sun. Although Saturn and Jupiter have larger moons that our own Moon, the fact is that these moons present, with respect to the Sun, alternate concave and convex orbits. These other moons are therefore true satellites of their respective planets. I’ve always thought this was a reasonable argument. Our Earth and moon if looked at from above the ecliptic both have a concave orbit around the Sun in the course of the year. I vote for Pluto as a planet. If the object orbits the sun in a concave orbit ( circular or elliptical – who cares) and it has enough mass so that it has achieved a “spherical shape” then maybe we should consider it a planet. I think it would be cool to consider the Earth-Moon system as a binary planet system orbiting the Sun. It would be the only one in our Solar System. There are many problems with the so called faint sun paradox. It is thought that the Earth had running water approx 4 billion years ago when the sun was faint. The problem being that if the sun was faint, then there would not be enough energy for liquid water; it would all be frozen. To overcome this problem it is speculated that there was very high CO2 and possibly up to 10 times atmospheric pressure. However, whilst that conjecture may explain how water was liquid on Earth, it runs into problems with Mars. It is thought that Mars also had running water shortly after formation, at any rate some 3 billion years ago. If the sun was faint, how was there enough energy for liquid water on Mars? Even with a very CO2 rich atmosphere, with a faint sun, it is is difficult to see how there was liquid water on Mars. I do not think that we sufficiently understand the formation of the solar system, nor the early life cycle of the sun,. It is all conjecture, just like this article, and whether there was in fact a snow ball Earth (as opposed to an Earth with a lot more ice at the poles). agreed. a mountain of conjecture supported by a thimbleful of observation. I read the Martian CO2 atmosphere was good enough to have running water. Evidently the water was there, they even had small deltas running into lakes and shallow oceans. If the sun was faint, how was there enough energy for liquid water on Mars? Even with a very CO2 rich atmosphere, with a faint sun, it is is difficult to see how there was liquid water on Mars. Current flux is low with our thick crusts. On young planets hardly any crust has devoloped yet. Perhaps even oceans of magma initially . 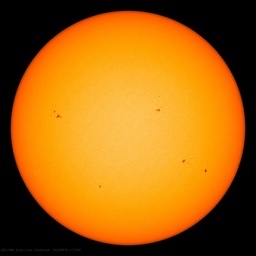 Plenty of energy available to explain away the faint young sun paradox. The GF just has to re-supply the energy the DEEP oceans lose to space. During a snowball earth the oceans surface is covered with either ice or the (faint young) solar heated surface in the tropics. Completely isolated from the atmosphere. Even with our 100 mW/m^2 it would take just half a million years to bring the oceans from freezing to boiling. 4 billion years ago, the amount of heat leaking from the Earth’s interior would have been more radioactive than it is today and would have been producing more heat. Argh, the problem of editing on the fly, the earth’s interior would have been more radioactive, not the heat coming from the earth’s core. I prefer your last scenario, but perhaps would extend that to the tropics.. I am very sceptical that there was a complete snow ball Earth. ..well I have read that the moon used to be closer to the earth but is now farther away due to tidal drag. As you say the moon was far closer to the Earth and this meant that the Earth spun a lot quicker and the day was only about 4 hours long. The speed of rotation has gradually slowed as the moon has receded such that a day is now 24 hours. Whilst the sun may have been faint, one needs to take account of the speed of rotation since there is far less time to cool, especially the heat sink oceans. Consider the scenario where the oceans receive say 2 hours of sun, 2 hours of night, then 2 hours of sun etc. As time goes by and the moon further recedes, it would be say 3 hours of sun, 3 hours of night, then 3 hours of sun etc. I am far from convinced that there was ever a complete snow ball Earth. and these types of papers appear to be founded on a lot of conjecture. The earth started out spinning quite rapidly, with maybe 10 or 15 hour days. Thanks to tidal friction, the earth has gradually been slowing down. To conserve angular momentum in the system, the moon gradually gets farther from the earth, keeping the angular momentum of the system in balance. Runaway…… Positive Feedbacks…. Tipping points….. They never explain how the runaway climate change reverts back to normal. So what are you saying, they should keep their very reasonable sounding hypothesis to themselves until they figure out the rest of it? I think you’re being unfair. Yes. It is easy to point out holes in theories. The authors should explain why the ice event terminated if they expect anyone to believe their theory explains what caused the ice event. Last time I read about this, “they” claimed that the position of the continents caused the ice event, and the ice event terminated as the continents drifted into a different configuration. Harder to do real science than to guess, they should do real science, not guess. Here is an important quote from the post. That’s a laugh. They “demonstrated” nothing. 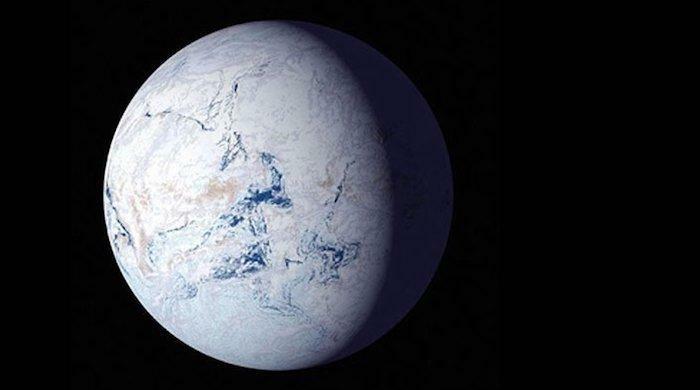 It is hard to say the hypothetical model produced the hypothetical snowball earth nearly a billion years ago. Just how would one go about parameterizing their model? Initial condition? Boundary conditions? If that could be done how would they quantify the inputs to the model? I know the Tooth Fairy exists because when I was little, I got a quarter under my pillow each time I lost a baby tooth. I believe my assertion on the Tooth Fairy is stronger, and more believable, than their modeling results based on assumptions nearly a billion years ago. What I have read is that over time volcanic ash would accumulate, ice would melt and grand thaw would proceed. Leonard celebrates ignorance and declares it a waste of time to do research into the past. Good for Leonard. Iffen large scale volcanic activity that deposited large quantities of dust particulate high in the atmosphere was the cause of a “snowball earth” …… then gravity would have eventually deposited said dust particulate on top of the snow/ice covering the earth’s surface and the melting of the “snowball earth” would have begun. And once there was again “open water” at the equator, the melting would have quickly exacerbated. Leonard celebrates ignorance and declares it a waste of time to do research into the past. Not a waste of time but this research clearly falls into the category of philosophy rather than science. A lot of “science” these days is actually philosophy. “Stoning nonconformists is a part of science. Stoning conformists is also a part of science. Only those theories that can stand up to a merciless barrage of stones deserve consideration.” —? however. I don’t agree with you comparison. This meets the hallmarks of science as we understand it today. It looks at evidence, it puts it in context with what is known or reported. Why would the dust high in the atmosphere not have the same effect of absorbing solar radiation as dust on top of the snow/ice covering? It’s not clear there ever was a Snowball episode (although its possible). But if there was it was likely caused by the position of the continents on the global or possibly large fluctuations of the sun’s output. We might be able to shed some light on the subject by studying Jupiter’s moon Europa. It looks at evidence, it puts it in context with what is known or reported. Model results are aligned to philosophy and are not evidence. Philosophy takes what is known in context and reasons results. That seems to be whats happening here to me. Just as Newton stated, God comes along and puts it right every so often. Spot on, Joel – you beat me to it. You don’t need CO2. Snow/ice albedo gets you into a snowball earth. You just need ash/soot deposited on the ice to get you out. Because as multi-year net melt starts, the dark material tends to accumulate on the surface resulting in a +ve feedback. We see this in some summers in Greenland when the ice surface can be almost black. Once most of the water is covered with ice, further snow fall drops to almost nothing. This allows whatever ash is being produced to increase it’s concentration on the ice surface year over year. Also getting out of ice ball earth sets a lower limit on ecs. All they can do is guess. They don’t know. Unless someone develops a time machine, they’ll never know. @ seaice1. I said nothing whatsoever against science. CO2 has practically no effect on the end of Snowball Earth intervals, except incidentally, as more of it is released as supercontinents break up and move apart due to seafloor spreading from volcanic activity. Plate tectonics and other geologic activity create and terminate Snowball Earths. CO2 is along for the ride. There is no they. One explantion I find reasonable is that with the carbon cycle shut down, volcanos emitted carbon dioxide and over several million years (about 4 million if I remember right) the CO2 level reached about 10 percent or 100,000 ppm and at that point trapped enough heat to start melting the ice. Once things got going to had an enormous quantity of carbon dioxide which got turned into carbonaceous rock such as the White Cliffs of Dover. That’s what I remember of it anyway. The problem is that by the time CO2 reaches 500ppm, it’s already blocking about 97% of the energy that it is capable of blocking. Going from 500 ppm to 100,000ppm just gets most of the remaining 3%. CO2 has never been that high since the Archean Eon, ie about three billion years ago. The conjecture of GHGs ending Snowball Earth intervals was hatched by the Carbonari. There is zero actual physical evidence to support the suggestion, which isn’t even an hypothesis. Carbon dioxide was much higher than now (7000 ppm) during the Cambrian Period, which followed a major glacial episode, but GHGs are not why Snowball Earths end. 1. Most of the Canadian Shield (paper’s then Franklin igneous province) is igneous basement rock (so there,is nothing sedimentary underneath to be sulfurous). Moreover, it is not high sulfur basaltic rock (Siberian and Deccan traps, seafloor spreading ridges) it is low sulfur andesic rock (think feldspars and granites). 2. You are reading this stupidity. We know that the great oxygenation event started ~2.2 bya with evolution of cyanobacteria. Lasted about a billion years. The great rusting, as atmospheric oxygen did not build until all the weathered iron sediments rusted. And it was over by the Ediacarian, with by then enough oxygen in seawater from the atmosphere to enable development of soft multicellular life forms (which then evolved eyes and hard parts during the Cambrian explosion ~620mya.) Now if the ocean surface froze completely solid as this paper asserts, then atmosphere/ocean oxygen exchange would have been stopped, and all the Ediacarian ocean life forms would have suffocated. They didn’t, as sentient readers of this blog eventually proved. 3. More damn catastrophe models about tipping points. SciFi. While the exposed Canadian Shield is indeed deep-seated igneous rocks, it had to have been intruded at great depth for it to crystalize as coarsely as it has. That implies overlying sediments. However, the question remains, “Where did all that presumed sulfur come from when life was essentially just beginning?” I’m unaware of any study pointing to high sulfur content as being characteristic of sediments older than Precambrian. CS, the paper requires UNDERLYiNG sediments. There arent any by geological definition. But I completely agree ( and spent another geologic hour searching ) that there are no sulfur enriched sediments (all biological mechanisms) before the PreCambrian. Problem is, basement rock predates PreCambrian (e.g. ediacarian) plus possibly formerly sedimentary rock (now almost always metamorphosed. The Shield is all igneous or early metamorphic, most dating to ~1.9-1.8 bya. Well, if that metamorphism caused the ice ball at ~700 mya, it was about a billion years early. What we see today are not the eruptives, but the sources for the eruptives. The volcanic rocks are long gone! Yeah, let’s see a map of what they are specifying for the volcanics. I don’t buy the 10-year eruption explanation either. Cratons are not accreted to in a geologic day. They say in the abstract that the “The Natkusiak was emplaced into an evaporite basin and entrained significant quantities of sulfur,” without much doubt. It is outside my area, but it looks as though they do have support for the existence of high sulfur concentrations, even including an estimate of the concentrations. But on the off-chance that it is correct, I think we should spit out as much CO2 as possible, since a warmer Earth will make it less likely that these intermittent, huge volcanic events will trigger a snowball Earth. “Cambrian explosion ~620mya” — … ahem … 540mya give or take a bit? The oldest ediacarians currently identified are from around 600 mya per Wikipedia? There was a brief glaciation (Gaskiers) between those and the better known ediacarian beds at Mistaken Pt, NL around 575 mya. But I think the article is about the Sturtian glaciation which Wikipedia puts at 717-660mya. There are some problemetic megafossils older than the Sturtian — e.g. Chuaria. And there is abundant evidence for life prior 717mya. Indeed, the great oxygenation event seems to require photosynthesizing organisms. So how did life survive the Snowball Earth? Acritarchs are tiny organic things that are quite sturdy. They are thought to be “body” parts from mostly single celled organisms. Their diversity dropped during the Sturtian, but they made it through and diversified again afterwards. Which suggests that some critters somewhere on Earth were eeking out a living right through the Sturtian glaciation. So maybe the Sturtian wasn’t as complete a iceball world as the press release suggests. I think that is the best argument against an Earth totally covered with ice. Since the oxygen was coming from the seas, isolating the seas from the air would not result in oxygen starvation of the oceans. Only if the ice got thick enough to stop photo synthesis would oxygen production stopped. I wonder where, if anywhere, this discussion will go. Aerosol cooling is not that well understood, so attributing a large effect for it in the past seems doubtful. So if the entire planet was covered in ice, where did the energy to melt it all come from? A gradualist warming would not work, because “normal solar output” would be negated by both the reflective properties of the ice and the negative effect of the huge thermal mass of the ice. Did the sun go super nova for a while? How exactly did all the ice melt? Chaotic systems just change states sometimes. Or maybe a meteorite dropped dust on the ice and changed the albedo. Or an earthquake cracked open the ice. Or the wind gradually piled up the ice until it collapsed under it’s own weight re-opening the oceans and life. Or maybe the equator was always free of ice. We do have observations that indicate a long-lasting steady state: Snowball Earth. You would expect more observation to survive that indicate that than a brief transitory phase: The Melt. It also should not be forgotten that early in Earth’s history, the day was only 4 to 7 hours in duration, rather than 24 hours. Although, the sun might have been weak, the oceans were being warmed more effectively and evenly since there was say 2 hours of sun, 2 hours of night, 2 hours of sun etc. At Richard Verney, if the rotation of the earth at that time was 4-5 hours long ( and if there was a moon) what would the tides have been like? Could that have created enough energy to break the ice although it ( at that rotational speed) that doesn’t explain how the ice formed in the first place or if there was enough water either. Or am I missing the overall point here? There are a lot of “conjectures”, and theories on this subject. SUVs. Lots and lots of Chevrolet Suburbans. Ice and snow is a good insulator, so Earths crust would have warmed from the core and eventually become hot enough to melt through. A combination of the sun and Earth’s own internal heat. And this reminds me of If the world should end in ice, by The Handsome Family. They also have the “… end in fire” version. “About ten million metric tons of sulphur”. I wonder what that is in imperial tons, or just plain unspecified tons. Probably about ten million. 10,000,000 metric tons = 9,842,065.276111 imperial tons. When sulfur dioxide gets into the upper layers of the atmosphere, it’s very good at blocking solar radiation. Then, why sulfur dioxide does not block solar radiation in Venus? So thus it sits up there without a “path back to the surface”. H₂SO₄ in a humid atmosphere definitely DOES come back down. H₂SO₄ is “hygroscopic”, thus loves to glom onto H₂O (humidity). Droplets grow bigger. Bigger is heavier. Heavier sinks. Etc. The clouds act as an infrared mirror, along with the CO₂. I thought I got it the first time I read it, but on second reading, I have some questions. And after the droplets sink (rain) the effect will disappear. right? The South Pole has a desert climate, almost never receiving any precipitation. Air humidity is near zero. Where does the O₃ come from (on Venus)? Or did you mean O₂? urederrra, the end of the chain was SO3, a trigonal planar molecule with bond angles of 120 degrees. However I am not sure if that is significant as they particles may cluster into an aerosol which would reflect light. Rather as water droplets reflect light when they form into clouds. I found this graph of the atmosphere of Venus in the wiki link I posted above. As you guys can see, Venus has a layer of sulfuric acid haze. and a layer of sulfuric acid clouds. We speculate on the origin and physical properties of haze in the upper atmosphere of Venus. It is argued that at least four distinct types of particles may be present. 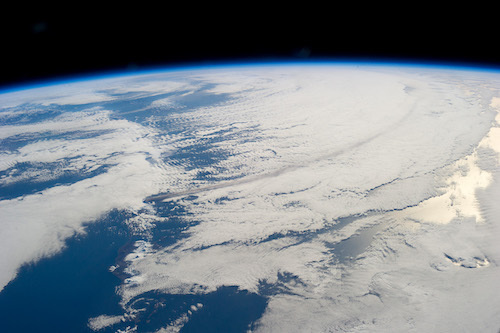 The densest and lowest haze, normally seen by spacecraft, probably consists of a submicron sulfuric acid aerosol which extends above the cloud tops (at ∼70 km) up to ∼80 km; this haze represents an extension of the upper cloud deck. Measurements of the temperature structure between 70 and 120 km indicate that two independent water ice layers may occasionally appear. The lower one can form between 80 and 100 km and is probably the detached haze layer seen in high-contrast limb photography. This ice layer is likely to be nucleated on sulfuric acid aerosols, and is analogous to the nacreous (stratospheric) clouds on Earth. At the Venus “mesopause” near 120 km, temperatures are frequently cold enough to allow ice nucleation on meteoric dust or ambient ions. The resulting haze (which is analogous to noctilucent clouds on Earth) is expected to be extremely tenous, and optically invisible. On both Earth and Venus, meteoric dust is present throughout the upper atmosphere and probably has similar properties. So, why all these aerosol forming chemicals could have cooled the Earth but cannot cool Venus. which is so covered by clouds that the surface cannot be seen? @Tom Halla: It seems you were right. Bryan A. That does not make sense. Pressure cannot maintain heat. If we pressurise a gas it heats, but then it cools again. Pressure does not explain the high temperatures on Venus. The answer on Venus must be down to the energy balance. These reflective aerosols give Venus an albedo of 75% That means only 25% if incoming radiation is available for heating the planet. Although it is closer to the sun, the surface receives less energy than does the Earth. This is enough to cause the temperature, given the atmosphere it has. Here is a review article from 2007 that reviews the state of understanding at that time. At least skim over it and comment if you have queries with it. CO2 is a lousy mirror. It reflects nothing. It absorbs ~90% (across the IR spectrum). It re emits ~20%. A scientific speculation at its best. All science starts as speculation, no? Correlation is not causation, but it’s often a good clue as to where to look for causation. The science is settled ??? Doesn’t seem that way on Snowball Earth. Auto, can you find a single reference to the science of snowball earth being settled? No, because nobody claimed it was. Yes, snowball earth is a climate state and climate science is settled. If it weren’t, there could be no climate deniers. As we all know, there are plenty of them. QED. Doonman, nobody says climate science is settled. At last nobody worth listening to about climate. If they said it was settled they would be doing themselves out of a job. Given the low opinion of climate scientists expressed here where they are assumed by many to be lying and cheating just for the salary they get it is hardly likely that they will say the job is done, is it? Come on, get your stories consistent. Unfortunately, climate science has been reopened. Minor things, which as hottest year ever, framed it. Some unknown parties have manipulated the datasets. Cooling the past. Science should not have to manipulate the past data. False data create a religion, not a basis for truth, but a convenient lie. All that was exposed in the emails, years ago. And again recently, in dataset investigations of temperatures records of the past. Someone actually looked and compared the temperatures with the datasets and found the datasets were wrong. So, how do you reset the records, when someone tampered? But, then again, why would they tamper? If this and if that… I must admit to some frustration at articles like this. Surely the ifs can be ‘tested’, like, look for the sulphur or some tell-tale compound/effect/signature in the geology – just like they found iridium coincident with the 65mya asteroid extinction of dinosaurs. A problem is that snowball Earth wasn’t frozen for such a long time that it is easily or clearly aligned with other events. So maybe super-volcanism coincided with a few weak solar cycles while the planet was in its coldest orbital precession and eccentricity simultaneously. That might “tip the bucket” (…flashback of Mr. Creosote in Monty Python’s “The Meaning of Life”). I wonder if these Harvarfellers can rule all that out. I’m working on an app that compels people to throw their wallet over my fence as they walk by. Now THAT’S an app. Greens beat you to it. But their method doesn’t work on everybody. Their app calls people names if they fail to support the cause. That’s their failsafe. if the event happened we have to cook up some theories as to why it happened. For an event that long ago none will be flawless. Boring speculation with little practical outcome. Was it just once the earth froze over? I thought it was 3 times that it froze to the poles. You see, there was a similar claim of a similar condition ~ 2.4 billion years ago in another blog post here at WUWT some time earlier……..but I did not miss then the”actual” evidence to be claimed as a support for it…..any one that can help with this please…… What is actually the evidence that such a claim (the snow ball condition of the `700 million years ago)a is based on? Very hard for me to contemplate this as a once in a billion years event. From my point of view it never did happen in the first place…never mind of it being a billion years periodic event…….please any help with this will be appreciated…. What an abolute load of frozen baloney. How could a trace gas do that? I think the issue for this time period is “where was super-continent Rodinia at this time?” It is often placed kind of equator-oriented like Pangea was but it was breaking apart at this time and, in the next 85 million years, major parts of it came back together to form another semi-super-continent Pannotia which was mostly centred over the south pole. 85 million years later, most of the continents were locked together over the south pole and we had the last Snowball Earth at 635 Mya. In 85 million years, the continents are not going to move from the equator to the south pole. This kind of movement takes 200 million years. So let’s say most of Rodinia as it was breaking up was actually near the south pole. Maybe some was close to the equator but large land masses were at the south pole like they were 85 million years later. Well, this is what the Earth looks like then. Think of Antarctica being ten times bigger and still centred over the pole like today.. Glaciers almost to the equator. So much sunlight gets reflected by this white Earth (let’s say 50%, versus today’s 29.8%) and yeah, the Earth is a Snowball. Bill, I like your explanation as it follows Occam’s razor: the simplest explanation is usually correct. All that is required is plate tectonics. Bill, paleolatitudes seem to be based on the magnetic fields preserved in rocks and the assumption that the Earth’s rotational and magnetic axes have always been roughly aligned. Since we don’t know exactly how the magnetic field is generated it’s possible that the assumption about alignment is wrong and sometimes the Earth’s magnetic poles are near the equator. In which case, assumption about where continents were in the far distant past could be wrong. Don, I’ve been saying this for years. Within historical times, the north magnetic pole has moved from 77°N to 70°N to about 80°N and still moving quite fast. The South magnetic pole has moved from 79°S to 64°S. So paleolatitudes determined from rocks deposited in the last 400-500 years could be off by as much as 26°. And who knows what polar wandering has done before historical times? Sorry, paleolatitudes are an approximation at best and quite possibly without any real meaning. “Glaciers at the equator = snowball earth” is not what I’d call settled science. Also BTW, if you want a volcanic episode to explain just about anything, you can have your pick. Take a look at http://www.largeigneousprovinces.org/ – there have been lots of them over the earth’s history. Enough that you can usually pick one that overlaps in time with the event you’re trying to explain. And they aren’t instantaneous; the North Atlantic Igneous Province (Scotland, Ireland, Greenland) started 60 MY ago and is still going on in Iceland. Don’t get me started on mantle plumes. As I understand it, the evidence for snowball earth was evidence of glaciers on land that was thought to be on the equator at the time. If the your theory is correct and the land was actually close to the pole, then the evidence of snowball earth disappears. Here is my guess. Not only was this due to the direct effects of blocking warming rays, it sent the oceans into net absorption since they were starving. If no evaporation is occurring, there is no heat available on land. Ice continues to build blocking further evaporation. Eventually some spot gets opened up via ice cracking open or a seamount spilling warmth close to the surface and evaporation is allowed out. Tom, you are wrong. That is not how science works and the authors did not just “guess”. The put their research into context with an introduction with references explaining how they know their hypothesis is at least reasonable and consistent with current understanding and why their approach is a reasonable one that is likely to provide sensible answers. They then present their methods, results and conclusions and again put these into context with previous studies. This is not just a guess. Pamela Grey may have the right answer, but until she can present it in context as above it is nowhere near as good as the hypothesis presented by the Harvard University researchers. I would agree with seaice1 as well, which is why I use words such as guess, conjecture, etc. And don’t go anywhere near the laughable statistics sometimes referred to as “confidence probabilities”. Ok, not a guess, an Educated guess. Ii other words, a calculated guesstimate, as we engineers say. Oh no, please tell me we don’t have to go through all this again. Thanks for that link, Mike Jonas. What fascinates me is what ‘evidence’ exists for the ‘snowball earth’ conjecture in the first place. I mean how would they ‘know’ if the central areas of a vast ocean were frozen solid? I’m sure someone has a concise explanation. As I recall, the evidence is the presence of drop stones in fine grained (off shore) sediments that were supposedly deposited near the equator. Drop stones are dropped from the bottom of glacial ice shelves and the icebergs that calve from them. One wonders though where they were when they dropped given that the earths surface moves about. That is determined by examining the angle of the magnetic field in igneous rocks. If the magnetic field at the time the rocks formed was nearly perpendicular to the ground, then the rocks were formed near the poles. If the magnetic field is nearly parallel to the ground, then it was formed near the equator. Perhaps if we asked the folks trying to survive the current snow-blizzard-global warming in the Northeast US they would be easily convinced, and terrified, that ‘Snowball Earth’ is upon us now! Interesting theory but it also depends on tectonics and continental drift to provide the driving force that allows large scale volcanism to act in precisely the ‘right’ way. Therefore something MUST have happened to the earth previously to imbalance the amount of crust so that all ‘loose’ stuff floating on the core is driven toward what is now the Pacific. Guesswork on top of guesswork. A similar volcanic event occurred during the 1-million year Siberian Steppes eruption, which led to global temps falling 10C, and leading to a mass extinction event. The huge increase in SO2 emissions created sulfuric acid clouds to form in the upper atmosphere, which greatly increased the earth’s albedo, reduced sunlight, inhibited photosynthesis, which lead to dangerously LOW CO2 levels (perhaps below or near 150ppm), which is the minimum CO2 level required for photosynthesis to occur. Although a full-blown ice-ball earth event didn’t occur during the Siberian Steppes eruption, it did lead to a mass extinction event. I’m sure all the added H2SO4 substantially lowered oceans pH levels, which may have approached acidic levels towards the end of the Siberian Steppes event. So, does that iceball planet include the continents NOT being in their current spots? Plate tectonics always do strange things, don’t they? Iceball earth… okay, but there are reasons it wasn’t an iceball. So did you guys see the Reuters article that says humans have next to nothing to do with climate change or the Arctic ice cap melting? That it’s all natural cycle stuff? Seriously, the whole climate-warming-disappearing ice cap-carbon levels business is less about science than it is about money, money, money and grubbing more money to get status and position. The “evidence” for Snowball Earth is plausibly questioned by Canadian geologists, who are very familiar with glacial formations. I think that their argument is convincing i.e. there was no Snowball Earth. The supposed evidence for “glaciation” can be explained differently and the problem of causation disappears. Even the ABC has reported a challenge to “Snowball Earth”. Seemingly, it really was cold back then, but maybe not that cold. Explanations seem to tally with today’s short attention spans: even though there are a few spare million years in which the causes can develop, everywhere I look the story is distorted to bring in a sudden event. That or a CO2 explanation. I think the snowball earth hypothesis is almost as wild as Climate Change. we can only guess at the geological arrangement of the continents at the time and thus where the evidence (drop stones etc) might be deposited. It’s also possible that the earth’s wobble changed the location of the poles sufficiently to cause unusual glaciation in what are NOW equatorial regions. The early earth was also more active, this volcanism adds heat at the bottom of the atmosphere which any insulating effect by sulphur would exaggerate. I consider the snowball earth hypothesis to be low probability pseudoscience although I don’t discount chocolate royal earth, (Hemispherical half marshmallows in winter). Science is going into a fantasy phase in desperation for relevance. It had already gone into a ‘performance’ phase during the latter several decades as numbers of scientists experienced exponential growth (scientists who people written history number several dozens; climate science has some 100k papers published during one decade – the only remarkable discovery of “97% Cook” ). Lord Kelvin was pooh poohed for stating near the close of the 19th century that science had pretty well discovered all but a few details, but he was essentially correct – yeah, one guy rearranged it all but not much has happened since. Engineers built tools for interesting details to be discovered, but, as with music, the great composers created marvels with a dozen notes and a few octaves, but they essentially used up the pleasing combinations over 300yrs. The 20th Century brought Stravinsky and other abstract desperation to close off the era, but soon music became performance stuff with little in the way of new enduring compositions. Today, the world is flooded with them – all performers. It’s ironic in my musical analogy that hungry physics came up with ‘string’ theory (dark matter, too but less musical). Anyway, paraphrasing Lord K, hundreds of thousands (millions maybe?) of ‘hard’ scientists, like our Harvard doctors above are perforce performers with a heavy dose of fantasy in their renditions. It is probably why climate scientists have a revulsion for data in the raw and real experiment in place of fantasy ‘experiment’. Hip Tanzanian youth coined a term in Swahili ‘kama kazi’ which translates roughly into ‘like work’ (but not exactly). It’s a good term for what climateers and snowball earth types do. The quote was similar to one by AA Michelson in 1894. But like so many quotes attributed to Mark Twain, Lord Kelvin deserves to have said it. Earth may well have been frozen but totally ice-covered not so sure. The colder it is the less evaporation to cause precipitation. So surely if the oceans are totally or even largely ice-covered then there will be no evaporation and no precipitation to cause all the land, especially in the tropics to be covered by ice. Since land cools a lot quicker than the waters do, the land would have been covered in ice first. Well, crap. Eventually we’re screwed. Oh well, hopefully the sun will come up tomorrow & life goes on. But if it doesn’t, remember to blame The Donald and the Russians. There is so much information and debate in this blog for the non geological. Could the authors of the discussed paper be invited to reply? More atmospheric deus-ex-machina? So only volcanos, bolides and CO2 can change climate? Tectonic plates and ocean circulation just passive onlookers? Sorry, I’m out, not buying it. Sorry. This is wrong wrong wrong & wronger than a wrong thing. These sounds and visions, a lot of them were red-coloured :-/ for some reason, actually mentioned Snowball Earths and they were *most* emphatic that carbon oxide did it. No volcanoes and sulphur and stratospheres and mess and Hercule Province or blah blah. Oh man gimme a break. Carbon Doidxe is The Cause of Everything – The Interweb told me so. The ice does the rest, etc. So how did the planet emerge from this iceage, how did it get warmer if the feedback would stop any warming in its tracks? The only theory that makes sense to me is that with the oceans covered over, precipitation (snow) would have pretty much stopped. As a result any ash produced by volcanoes would not get covered up over time. As a result, the amount of ash on top of the ice builds up year after year, causing more sunlight to be absorbed and eventually melting enough ice to start the feedback working in the other direction. Another point is that a covering of ice would insulate the oceans. Since the thermal flux from the earth’s interior would stay the same, this would mean that the oceans would gradually warm. They dunno, but they’ll know anyway. What many don’t mention about Tambora are the very cold conditions before as well as after that blow. Mt Laki in 1783, long, basaltic and super dirty, spewed far more muck than anything since, and we’ve had some whoppers. India (and Australia) still sweltered and parched disastrously by the start of the 1790s. Sure volcanoes affect weather in the short term. If it were possible to measure a global temp (maybe we can, but who cares?) I’m sure we’d see a down blip after a big blow. Sorry, but I can’t help suspecting that volcanoes are pulled out of the Facile Explanation Drawer by a nervous climatariat to stop our minds from entertaining impure thoughts. El Chicon only cooled the planet by about 1 degree F. That’s an average. If your area was scheduled for a heat wave, you still would have had a heat wave. Whole of Oz baked in ’83. Maybe it would have been hotter without Chichon. Maybe. Trivial stuff. The point is that volcanism has a bit of an effect on temps but it’s a pea-shooter compared to what brings on events like the 2200BC cooling and the LIA. Mind you, judging by all the fuss from Eyjafjallajökull in 2010, another Laki would make a real mess, especially if its muck caught the jet stream to Europe the way Eyjafjallajökull did. A bit of short-term cooling would be the least of one’s worries. Amazingly, Decade Volcanoes etc are underfunded. I wonder where all the climate dough goes. The largest glaciation event would be a once in a four billion year event. So the rest of their numbers have to be fact. Or at least worthy of seaice1’s admiration because … wait for it…”Harvard”. I don’t recall ever expressing admiration for Harvard. The Paleoproterozoic Huronian Snowball Earth glaciation might have been bigger, which started about 2.35 Ga. So the Neoproterozoic Sturtian and other Cryogenian Period glaciations are actually the largest of the past more than two billion years, at least. But maybe it’s like those 500 year floods which happen every century or so. I’ve been fascinated with global glaciation since early on in my earth science studies, but had to focus on petroleum science to pay the bills. While I’m aware of the impossibility of it happening, I wrote about a quickly occurring snowball earth event as the premise for a YA SciFi novel and published it early last month. (Yes, a climate fiction book unrelated to global warming hype) In the book, I give a different explanation for the original global glaciation events unrelated to any current theory, but that’s to support the fictional narrative of the story. A geology question if I may. For oceanic crust the average geothermal flux is ~100 mW/m^2. Given the accompanying geothermal gradient, how long would it take for the gradient to adjust to an overnight increase of the deep ocean temperature of eg 1K and re-establish the flux again? Deposition of the banded iron formations (thanks to O2 released by cyanobacteria in the Oxygen Catastrophe) in the iron ore rich Mesabi Range and other features of the western Great Lakes region appears to have been ended by the Sudbury impact c. 1.8 Ga.
At first, Macdonald’s team thought basaltic rock — which breaks down into magnesium and calcium — interacted with CO2 in the atmosphere and caused cooling. Sigh. Like an alcoholic pouring Gin on his breakfast cereal, they just can’t stop themselves reaching for the carbon dioxide.